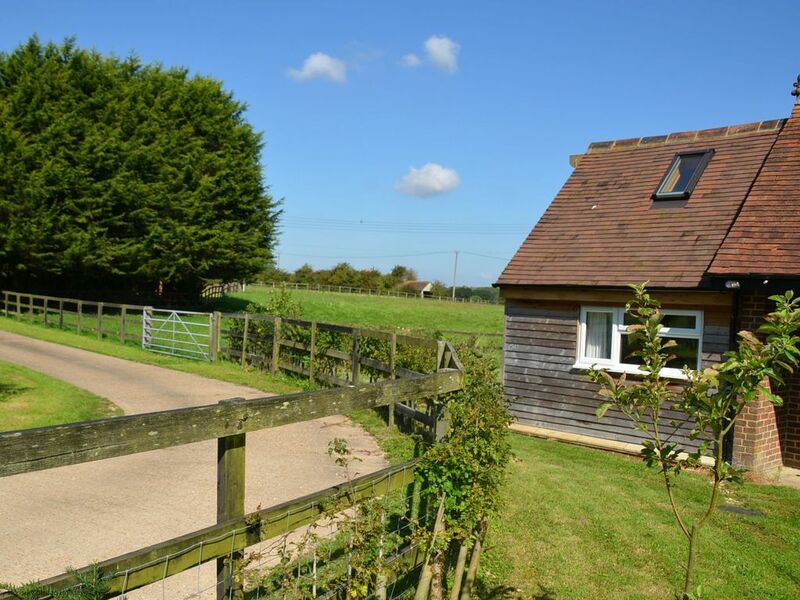 Hillside Cottage is set within the South Downs National Park and is a great base for exploring everything that Sussex has to offer and the accommodation provides everything you could need for your self-catering holiday. There are two cosy lounges one with a central woodburning stove. There is Freeview available via a Smart television and Wifi throughout the property. The kitchen has all modern conveniences including a fridge, electric hob/ oven and a washing machine. There is a dining table for four available in one of the lounges and also a small brekfast table area in the kitchen. There are two bedrooms, also on the ground floor, a double bedroom and a twin bedroom. The compact bathroom is located off the kitchen and has a half bath with shower overhead, WC and basin. There is a private garden area with views of the South Downs and parking for two cars in the gated driveway. Hillside Cottage has the advantage of offering a countryside setting and yet has easy access to many local attractions within in minutes including the South Downs Way, a 100 mile national trail from Winchester to Eastbourne. The pictureque village of Amberley is a lovely walk from Bury and has lots of character and appeal with many thatched cottages. This is also the location of the Amberley Working Museum , a great day out for all ofthe family. Arundel is a 15 minute drive from the cottage and has a wealth of attractions to see including the amazing Arundel Castle and gothic cathedral. There are many restaurants, bars and shops to keep every member of the party happy! This lovely cottage in the heart of South Downs country was perfect for a walking based holiday. The walk to the delightful village of Amberley across the fields was flat and easy. There were several other walks from the cottage for the morning dog walk. Only a few minutes drive away there were a selection of wonderful walks of varying difficulty in and around the South Downs Way, and also some beautiful forest walks. The cottage is very well kept, had everything I needed, was very clean, and nicely private. My only disappointment was the noise of the traffic from the A29. It felt very homely and I was comfortable and able to relax with my dog. Thank you for taking the time to leave a review regarding your recent stay at Hillside Cottage. We are delighted you enjoyed your stay and felt at home, we certainly hope that you will choose to stay again in the future. Ideal location ,clean, functional and ideally central for our holiday! We found the cottage ideally suited for our needs as we were attending the cricket festival and folk festival in Arundel , we found it extremely functional and extremely clean with all the amenities we could wish for, two bedrooms with double and single beds to cater for young and senior , two lounges with two tv,s again could cater for young and senior needs . A full kitchen with cooker fridge freezer and dining table , ideal to allow you choice wether eating in or out . A small practical shower room is a little cramped but you can’t have everything? As stated it was also ideally located not only for the principle reason of easy reach to Arundel but for a base to explore the South Sussex coast , West Wittering, Chichester and Bognor with Brighton not too far. We found the cottage clean and with fresh linen and it was easy to respect and maintain the cleanliness and left as we found . Although the cottage is located just off the main road we found it quiet and private and could enjoy the peaceful surroundings having small garden areas to relax in. All in all we thoroughly enjoyed our stay . Thank for your lovely review, we are delighted that you enjoyed your stay and hopefully you will choose to stay with us again in the future.